Sometimes, living in Oregon as we all do, I begin to think that B.M.W. is just another acronym for Bit More Water! 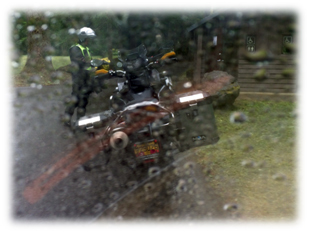 However, even occasionally heavy showers can never dampen the enthusiasm for a good ride. 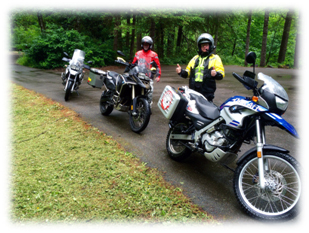 Three intrepid riders took to the roads to make a loop from Eugene to Reedsport, to Florence and back to Eugene. Temperatures hovered in the mid 50’s. The high point of the ride is between Eugene and Reedsport. For those of you who have not ridden the back roads between these two cities do so soon. The ride took us along the Crow Highway from Eugene. A quick left then right, on and off Territorial Highway gets you headed west along Wolf Creek Road. We followed Wolf Creek, and then proceeded to follow South Sister and Smith River Roads to Reedsport. Rain did not slow us down, only the heavy logging at Oxbow Summit held us up for a while. No worries, it was a great time to suit up with rain gear. We proceeded into Reedsport and had a very good lunch at the Harbor Light Family Restaurant that totally lived up to its 4.5 star of 5 stars on Yelp! Elk burgers, BLT and monster O-rings served. 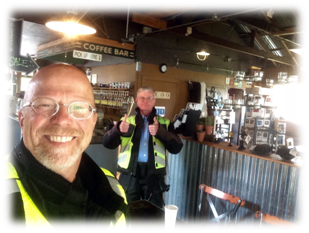 Following lunch, it was off to Siuslaw Coffee Roasters in Florence for some light-hearted conversation over caffeinated beverages and then returning to Eugene on Hwy. 126. Someone once said, “ If you wait for the perfect day, you’ll never do anything!” Rain? We preferred to just think of it as liquid sunshine… and my, doesn’t the air smell great today.